Being outside, any time of year can cause you to get a sunburn. Spring, Summer, Winter and Fall, your exposed skin is susceptible. Most of us naturally spend more time outside, gardening, tending animals, foraging, or just enjoying the sunshine and fresh air. Getting fresh air and sunshine is vital to health, actually. You still need to be protecting your skin from the harmful rays of the sun, and there are times when a big hand, sunglasses and light colored t-shirts may not be enough. Slathering on a commercial sunscreen isn’t always in your best interest, as there may be chemicals you want to stay away from. 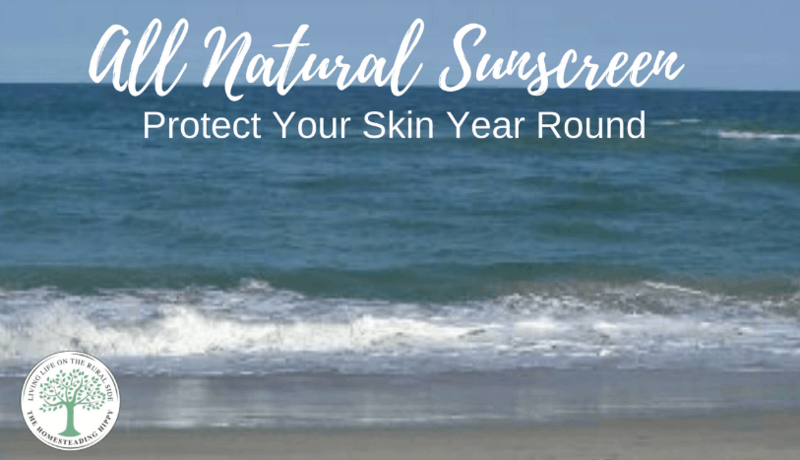 Making your own natural sunscreen is pretty easy and will go along way towards protecting your skin. Carefully melt the shea butter and coconut oil in a double boiler until just melted. Add the zinc oxide powder and stir until the powder is all mixed in. This took a loooooong time for me to do. Add the essential oils and mix through. Use liberally and apply every 2-3 hours, or after swimming or heavy sweating. If you do happen to get a sunburn though, you want to treat it as quickly as possible to help soothe the pain. Get a recipe for sunburn soothing lotion here. Applying a light layer of coconut oil directly on the burn can help to soothe pain, as well as keep it moist to minimize peeling. What do you do to protect yourself against sunburn? Will you try this natural sunscreen? I am always on the hunt for a good sunscreen recipe. I cannot wait to try this one! Thank you so much. you are welcome! Can’t wait to hear how it turns out for you! Wondering if you make a big batch how long does it last for? this size batch is what I take with us for a weekend at the beach for 5 people. It only lasts us about 2-3 days when we are putting it on every couple of hours. This is such a great idea! going to pin it right now! I’ve been weary about my own sunscreen because I’ve never worked with zinc oxide. You said it took a long time to mix in, so that’s good to know. About how long did it take to make and what do you store it in?